Yes 2 Youth is a “brain child” of the Youth Commission. It began as a movement of sorts, to rally the community to support our youth. Yes-2-Youth currently supports the Barn teen center, Inside Out Players and the Graham Dickinson S.P.I.R.I.T. Skate Park, through our fundraising efforts we hope to be able to expand this support to more youth movements. The Barn teen center, est. 1994, and Graham Dickinson SPIRIT Skate Park, est. 1998, have been filling voids for Ridgefield youth for many years. They provide the “perfect fit” for many young people by offering programs and philosophies that reach beyond the traditional, embracing diversity, inclusion, tolerance and respect. Both facilities contribute recreation, unique events, and a supportive social community, as well as guidance, leadership training and employment opportunities for hundreds of Ridgefield youth each year. What better way to say Yes-2-Youth? We are proud to be a part of the youth-serving network of programs in Ridgefield. The 1st Annual Fundraiser was held in February 2011 at the Community Center and was a success. The 2nd Annual Fundraiser was held on February 16, 2012, again at the Community Center. Live entertainment was provided by ‘Tyrtle’, a rock band composed of some RHS students and recent graduates: Scott Wilson (acoustic), Jack Rodamer (bass/drums), and Jeff Allen (guitar). For pictures from our 2nd Annual Fundraiser, taken by Lexi Lynch, check out our album on Facebook. The 3rd Annual Fundraiser is scheduled to be held on Thursday, April 11, 2013 at the Ridgefield Community Center. Please join us for hors d’oeuvers, a silent auction and cash bar as we raise money to support the Barn Teen Center, Inside Out Players and the Graham Dickinson SPIRIT Skate Park. These local gems have been filling voids for Ridgefield youth for may years. They provide the “perfect fit” for many young people by offering places and programs that reach beyond the ordinary, with recreation, unique events and a supportive social community. 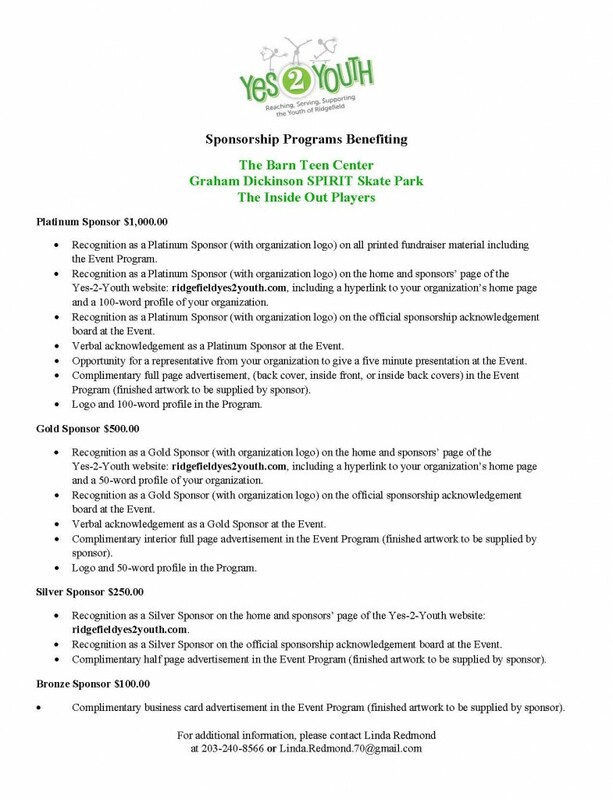 For more information on this year’s event, you can view the invitation and response card or visit the Yes-2-Youth website. In addition to donations and attendees, we are looking for auction items for our silent auction and for event sponsors.